In a quiet street just a stone's throw from the bustling Grands Boulevards, department stores and not far from famous theatres and performance venues, is the attractive residence chosen by the Touraine Opéra to welcome its visitors who have come to discover Paris. The surrounding area is also home to many companies, training institutes and other establishments, making it the ideal hotel for its professional guests. The hotel welcomes its guests into a large hall which extends and leads through into a well-proportioned lounge area. With its corners softened by wall patterns and furniture, elegantly decorated in stunning shades of grey, accented with a gorgeous bright orange, the open space invites our guests to share a moment of sociable relaxation in its generous armchairs and sofas. 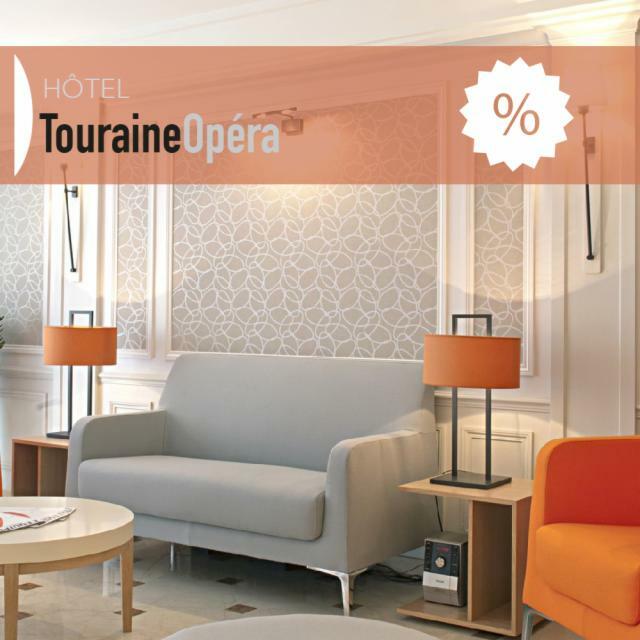 The space is a foretaste of the spacious comfort and similarly contrasting colours of the bedrooms at the Touraine Opéra.